Are you still routinely recommending paracetamol and ibuprofen for the treatment of fever in children? Should children with conjunctivitis be excluded from school? What dangerous interaction has been reported with topical miconazole? Which patients with shingles should be offered antiviral drugs? Should you use a dipstick to decide whether to treat a woman with cystitis? What medication should be stopped when a patient has D&V? Check the latest advice on antibiotics for otitis media. The members only section of our website is open to all health professionals for an annual fee of £25 (inc. VAT). 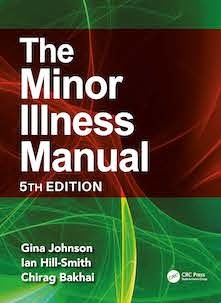 Six months free access to this site is available when you purchase the Minor Illness Manual. The National Minor Illness Centre (NMIC) is based in an NHS general practice in Luton, England. This is a training and research practice, accredited by the Royal College of General Practitioners. The tutors at NMIC are all practising primary care clinicians who see patients with minor illness on a daily basis and understand the problems which their management may bring. We are the authors of the standard text on minor illness, which has sold over 20,000 copies. We accept no sponsorship; our advice is completely independent. For the last fourteen years we have run accredited educational courses in minor illness management, initially for nurses and more recently also for pharmacists, paramedics and ECPs. This has given us a profound insight into the learning needs of health professionals in this field. We are proud of our reputation for telling you exactly what you need to know, and only what you need to know. For more information on our courses and update sessions click here; or to discuss commissioning a course at your place of work, contact us. CKS (Prodigy) has just changed its guidance to recommend considering 800mg aciclovir in adults who present within 24hr of onset of the rash, especially in a breastfeeding woman or if the rash is extensive.